Calling all JIRA Administrators! Now there’s help for managing your application! 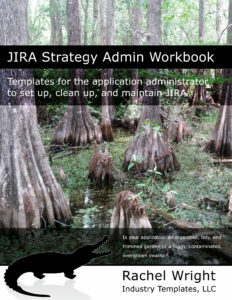 The JIRA Strategy Admin Workbook is finally here! If you’re a new Administrator, or your company is just getting started with JIRA, this book shows you what actions to take up front, so you can have a well-planned and easy to maintain tool. If your company has used JIRA for a while, this book shows you simple ways to streamline your instance and make daily work more manageable. Tired of dry, technical, and difficult to use software documentation? This is not documentation, it’s strategy! Get yours now from Amazon (print version) or the JIRA Strategy Store (digital version).